Many EHR and health IT vendors have eliminated obstacles to participation, and most have made connection to the network plug-and-play, a new report says. What's holding back widespread interoperability? The latest KLAS report says it's governance and organizations dragging their feet on participating in new national interoperability frameworks, such as the CommonWell-Carequality link. "Even Epic and athenahealth customers report diminished value from their connection when local exchange partners opt not to connect to the national networks," according to a new KLAS report on interoperability. "Until other vendors take an opt-out approach, you as an organization will have to be proactive in promoting local connections to these networks to ensure high value from your connection." Carequality's adoption among NextGen Healthcare customers. KLAS says that as of now, all of the most prevalent EHR vendors except Allscripts and MEDHOST are connected to the national framework provided by CommonWell-Carequality – "putting the ability to exchange patient records within the reach of most acute care or clinic-based provider organizations, regardless of size or financial situation." Vendors are at very different stages of supporting provider organizations in the national framework effort, KLAS says. All the major vendors have made commitments to support the CommonWell-Carequality link, because healthcare providers are demanding it, and it is such a low-cost option for them. Many vendors have eliminated obstacles on the path to participation, with all of them but Virence offering connections to the link for their customers at no cost. In addition, all but Cerner have made participation in the network plug-and-play. KLAS notes that Epic's and athenahealth's approach to facilitating participation, via an opt-out option, while removing governance barriers, "shows that regardless of customer size, vendors can facilitate widespread adoption if they choose." The latest findings by KLAS show a huge leap over a year ago, when Carequality, reported participation at about 50 percent, with more than 1,000 hospitals, 25,000 clinics, and 580,000 healthcare providers connected. According to Dave Cassel, vice president of Carequality, the organization was born out of industry demand, shaped by industry and government collaboration and it will ultimately succeed through industry support and participation. This summer, we reported that EHR interoperability was closing in on a signature moment with the advance of the CommonWell-Carequality link, comparing it to the cusp of a breakthrough akin to AT&T customers being able to pick up their phones and call Verizon subscribers. 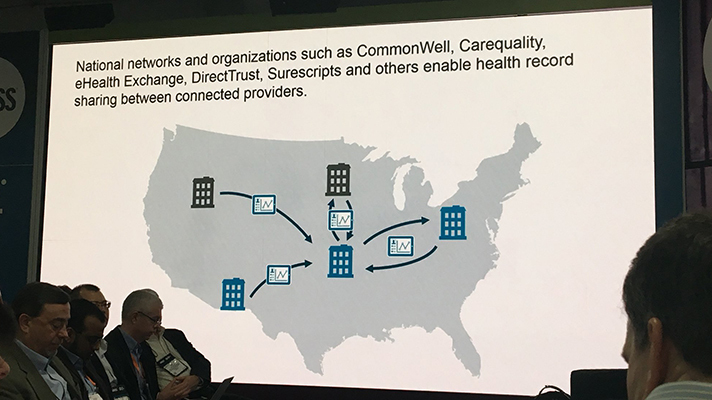 The CommonWell-Carequality link is changing the current thinking about the future of FHIR and open APIs, and laying the foundation for really using data in a meaningful way. "With CommonWell and Carequality linked, the biggest technical obstacle to widespread patient-record sharing has been removed," says the KLAS researchers in the December 2018 Interoperability Report.